Sir Richard Branson has said he's long wanted to start a cruise line, and he publically set the wheels in motion in March 2014, when he announced he would build two new ships aimed at a younger market. Virgin partnered with private financial company the Bain Group on the project, which Branson says comes in "under $2 billion." In December 2014, Virgin named Tom McAlpin, a veteran of the cruise industry, company president. In June 2015, Virgin Cruises announced it would build one additional ship (for a total of three identical vessels), with the first debuting in 2020.In October 2018, the line confirmed a fourth as-yet-unnamed ship, which will debut at the end of 2023. The name of the first ship, in keeping with Virgin's red theme, will be called Scarlet Lady. 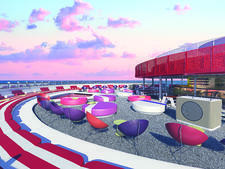 Virgin Voyages' first ship, exclusively for people 18 and older, will offer a trendy and energetic atmosphere. Branson promised he'd "make waves" when he first announced the creation of Virgin Voyages, and many of the announcements since then have been in line with that promise. One of the first details dropped is that the Virgin ships will be "Adult by Design"; only those 18 or older will be permitted onboard. Another feature of the ships, a tattoo studio at sea, will be the first of its kind. Cruise fares will also be more inclusive than with many other big-ship cruise lines, including all meals, basic drinks (soda, bottled and sparkling water, juices) and gratuities. The ships will have no casino and no Broadway-style show; instead they have a "Vitamin Sea" ideaology, which puts the emphasis on relaxation and wellness with plenty of relaxing lounges and six areas dedicated to spa and fitness. Which is not to say there aren't also plenty of bars and nightspots onboard as well. As for design, the line hired 10 land-based architects to help create spaces that will be more reminiscent of hotels than other cruise ships. Branson has expressed a desire to have the cleanest ships at sea, and in October 2016, Virgin Voyages announced a partnership with Swedish clean-energy company Climeon. The ships will introduce a system designed to turn waste water into electricity, which will in turn reduce the company's carbon footprint. The Virgin Voyages fleet will comprise three 110,000-ton, 2,750-passenger ships. The first one, which will debut in 2020, will be called Scarlet Lady. It will sail seven-night Caribbean itineraries out of Miami. Deployment for the second and third, which will sail starting in 2021 and 2022, is not yet known.